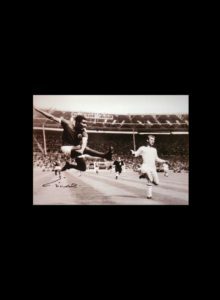 Malcolm Dawson writes…..I spent the weekend catching up some of my old muckers from the East Midlands, two of whom have season tickets at the Pirelli and got me a ticket for this match in the home stand. It is a strange experience sitting with the home fans but I suspected I wasn’t the only Sunderland supporter there as quite a few people sitting near me failed to jump to their feet when Albion scored and had remained quiet throughout. 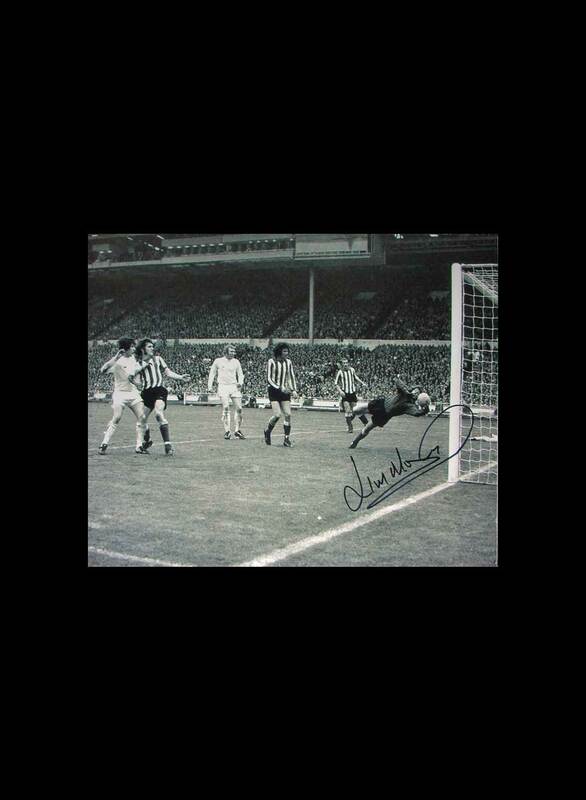 Pete Sixsmith was standing down the red and white end where the support was vocal as ever. Here’s how he saw this one. The first defeat of the season and I suspect, the first serious doubts about the manager and the players being aired in public. 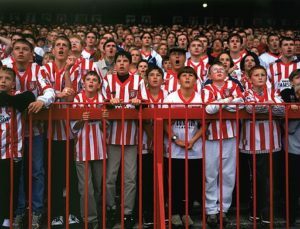 Certainly, the father and son combo stood next to me at the back of the terrace, made it perfectly clear that in their considered opinion, the lot of them were absolute s**** and they should be sacked/sold/ hung, drawn and quartered forthwith. Allow me to take a more reasoned approach to what was a disappointing defeat against a hard-working side who were allowed to dominate the first half because our team selection handed them the vital midfield area. A central midfield of Cattermole and Honeyman were unable to get any grip on the game, allowing Jamie Allen and the excellent Lucas Akins to dominate and control. Akins is a big man and covered ground well. Allen is much smaller and does exactly the same. Our two in that vital area are neither big nor particularly quick. Hence, we were outclassed and outfought in the opening period. The experiment of playing three up front did not work. Even before Wyke was carried off, it appeared that the three were uncomfortable in this formation. Maja was pushed wide, Wyke was left in the middle and I am not quite sure what Sinclair was supposed to be doing. By the looks of it, neither was he. For a tactic such as this to succeed, you have to play to strengths. Wyke had admitted that his best work comes in the 18-yard box. His one meaningful contribution was a clever flick to Maja which the youngster should have buried but dragged wide, much to the consternation of my young neighbour. Other than that, he got himself involved in some wrestling matches with Ben Turner, the Brewers centre half, grapples which he was always destined to lose. Turner looks as if he could make a living with Featherstone Rovers. Wyke doesn’t. H is departure led to a re-think and a much better balance in the side. Maguire foraged down the right with the ineffective Gooch down the left. The full backs concentrated on defending, although neither are great at that. Matthews was again booked for a needless challenge and is rapidly morphing into a poor man’s Billy Jones while Oviedo looked like a man who had just flown back from Costa Rica on a budget airline with his luggage on his knees. With hindsight (the greatest gift of all keyboard warriors), he maybe should have sat this one out. The two goals we gave away were poor ones from our point of view, but good ones from Burton’s. The opener stemmed from some skilful play by Marvin Sordell. His low cross was missed by Jack Baldwin, looking fallible for the first time, and was drilled into the net by Jamie Allan. The second came from a well worked training ground routine. A foul by Sinclair was punished with a free kick. David Templeton stepped up and delivered the kind of ball that we rarely do and central defender Kyle McFadzean, unmarked at the far post, thundered a header past McLaughlin. The boos at half time were a reflex action and they turned to cheers nine minutes into the second half when Maguire, collecting a pass from the returning Aiden McGeady, brought the ball forward and hit a 20 yarder into the roof of the net. After that, we had most of the play and had a couple of half chances which we failed to take. By the 50th minute, we had reverted to one up front as Sinclair had been replaced by McGeady, leaving Maja there on his own. 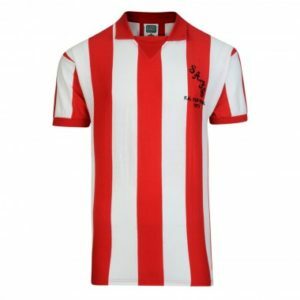 The youngster was tracked throughout by either Turner or McFadzean and was unable to create the space that he needed to maintain his excellent scoring record. He will need to think a bit more carefully when up against physical defenders of this ilk. I suspect Rochdale may have a couple next week. 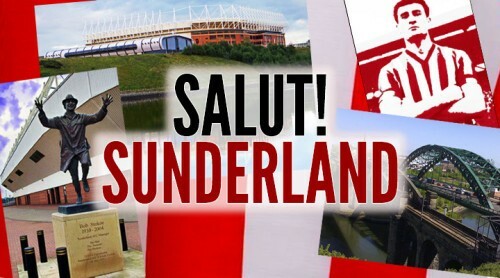 Ross now faces the first mini-crisis of his time at Sunderland. He has to be careful that it doesn’t blow up into the kind of crises that have done for managers in the past and I don’t see him playing with three up front again. It was a creaky performance and one that left some of our less patient support kicking the wall at the back of the Russell Tiles stand in frustration. It spoiled a good day out as well. Burton is a solid town, dominated by the Coors Brewery and huge warehouses now used as offices. I strolled into the town centre, ate a couple of delicious cakes at the MacMillan Cake Stall, followed by a nice chat with one of the workers and then made it to The Dog. A splendid pint of Henrietta from Welbeck Abbey Brewery in Worksop slipped down a treat in good company. 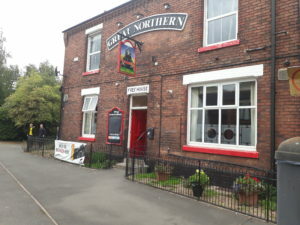 I then sneaked off and caught a bus to the ground, calling into The Great Northern for a pint of Burton Bridge Bitter, as fine an ale as you will find in this land. True bitters are dying out and are being replaced by Pale Ales that are frequently heavily hopped and have “stuff” added to them. Not this one. Described as a “bitter beer with a lingering aftertaste” it was English beer at its best. 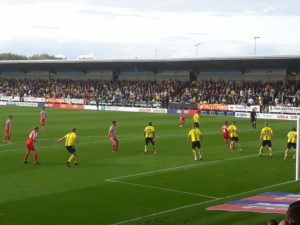 Quaffed in the company of three Burton supporters of my vintage, it made for an excellent start to what I hoped would be a season defining performance. Although in the main body of text I said I thought the challenge on Wyke was fair enough it was the kind of tackle that would probably have got an outfield player sent off. 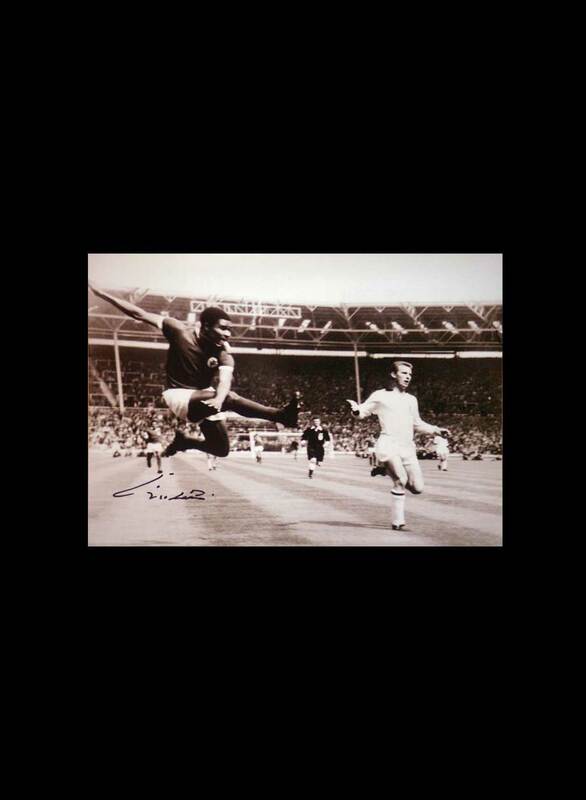 It was the sort of challenge that doesn’t seem to be acceptable in the modern game though I still think both players got to the ball at the same time. Replays might prove me wrong. And having seen it on the highlights I’ll stick with my original impression that it was a 50/50 challenge. We’ve had this defeat coming for a few weeks now . We can’t keep coming back after going behind. Hopefully this is a wake up call and we see a focused, disciplined, winning response next Saturday. Got to be honest, I quite like a pale ale. I’m off to coventry in a couple of weeks and was expecting the unbeaten run to come to an end there, so hopefully it’ll now be a win. It’s a setback, for sure, but let’s not start thinking of this as the beginning of yet another end. As Drummer said, we’ve had this defeat coming and I’m sure lessons have been learned from it. The team has shown that, even with injuries and before it’s really settled down as a cohesive unit, that it has the guts, the skill, the determination and the fighting spirit to hold its own in what was always going to be a tough league. Easy games? Not here. No need for panic yet, but we do seem easily bullied and as per the last 50 years we always look smaller and seem slower than the opposition.It’s a long season and we have some decent players so as supporters ‘beating ourselves up’ is to be avoided. 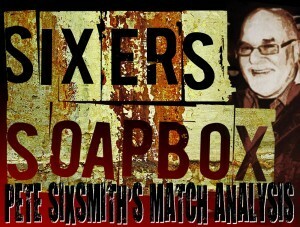 A fine report but did Sixer have to mention Billy Jones? Aaaargh ! I had a similar day out as Sixer, good company and optimism before the match, just good company after it. All the reports have repeated the malaise of the first half. Our full backs were easily beaten and put on the back foot, the midfield was nowhere, and the strikers were dreadful and didn’t get a look in over their markers. Maguire’s goal was excellent, but we created nothing thereafter to trouble what looked like a dodgy keeper, he needed a battering. Our crosses were rubbish – Maguire wasting the best chances and one overhit cross was particularly deflating when we finally had numbers in the area. Wouldn’t blame Baldwin for the opening goal, Oviedo was beaten all ends up and they had about 3 guys waiting for the tap in.